Enlarge / Net neutrality supporter protests the FCC’s repeal outside a federal building in Los Angeles, California, on November 28, 2017. While the California Senate approved the bill with all of its core parts intact last month, a State Assembly committee’s Democratic leadership yesterday removed key provisions. The committee made those changes, but cellular industry lobby group CTIA still urged state lawmakers to vote against the bill entirely, saying that the “state-by-state regulation of the Internet is inappropriate.” But CTIA has also consistently opposed federal regulation of net neutrality. The USTelecom lobby group has said it will “aggressively” sue states that enact net neutrality rules. 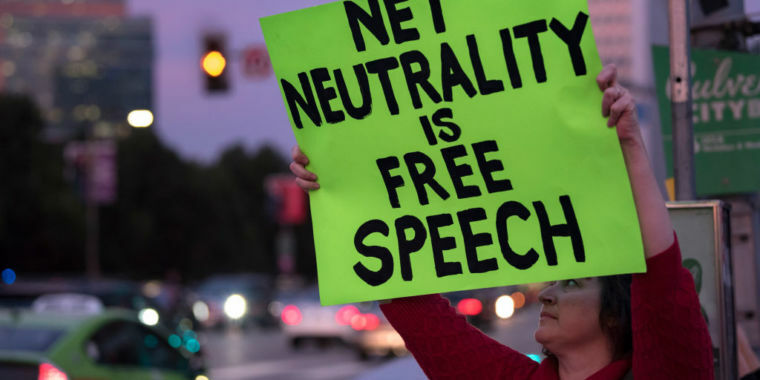 The California bill is seen as having national implications, as numerous states are considering net neutrality legislation. House Minority Leader Nancy Pelosi previously urged the state legislature to pass the strong version of the bill. The bill as amended still has bans on blocking or throttling lawful Internet traffic and a ban on paid prioritization. Those rules are similar to the nationwide ones recently repealed by the Federal Communications Commission. But one amendment eliminated a ban on ISPs demanding payments from websites or online services “in exchange for access to the Internet service provider’s end users.” The ban on blocking or throttling would seem to prevent an ISP from demanding payments for mere access to its network. But eliminating the ban on access payments could make it easier for ISPs to find a way around the anti-blocking and anti-throttling rules. Another amendment approved yesterday removed a provision that would prevent ISPs from charging online services for zero-rating, which exempts Internet content from data caps. 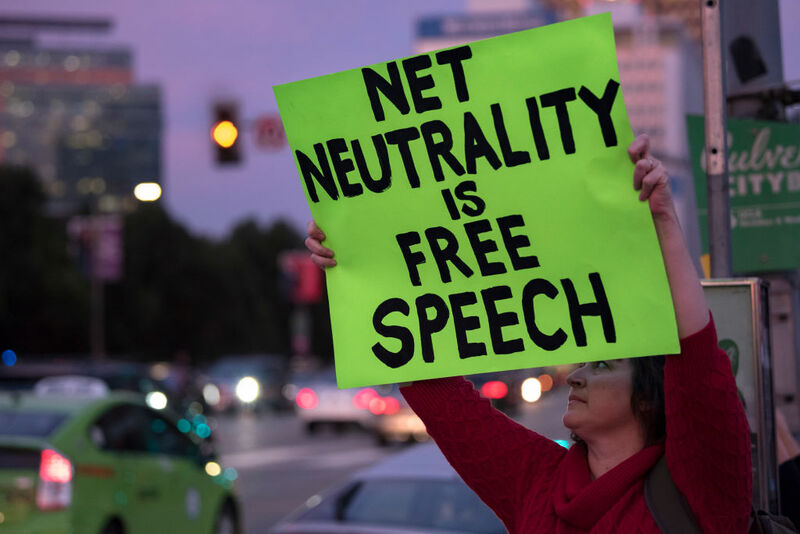 Many net neutrality supporters say that ISPs impose data caps in order to create an artificial scarcity that is then “solved” by websites or online services paying the ISP to circumvent the caps. Yet another amendment passed yesterday removed a requirement that ISPs maintain enough bandwidth at network interconnection points—that proposed rule was supposed to prevent re-occurrences of the Netflix problems of 2013 and 2014. The amendments were passed by the Assembly Communications and Conveyance Committee, which is chaired by Miguel Santiago (D-Los Angeles). The committee approved the amended bill and referred it to the Committee on Privacy and Consumer Protection, which could reinstate the original provisions or make other changes. The committee approved the amendments shortly before taking comment from bill supporters and opponents at a public hearing. “[T]he Assembly committee forced hostile amendments into the bill before even holding a hearing, before taking any public comment, and only 12 hours after making those amendments public,” Wiener said. After the hearing, the committee approved the amended bill by a vote of 8-2. The aye votes were cast by seven Democrats (including Santiago) and one Republican, while the noes came from two Republicans. A no vote in this instance signifies opposition to passing even the weakened form of the bill. Net neutrality advocacy group Fight for the Future accused Santiago of corruption and said that “California Democrats work[ed] with Republicans to gut [the] net neutrality bill.” AT&T is one of Santiago’s top donors. Santiago’s statement on the bill said he intended to reinstate the Obama-era net neutrality rules but didn’t address the major changes passed by the committee, according to Fortune. “California should once again stand as a back-stop of ‘the resistance’ by beating back both the Trump’s Administration and the billion-dollar corporations he’s trying to protect,” Santiago’s statement said. Could planets orbiting Alpha Centauri harbor life?